There’s still 3 days left in the eBay auction for Tom Noll’s original Stevie Ray Vaughan painting. 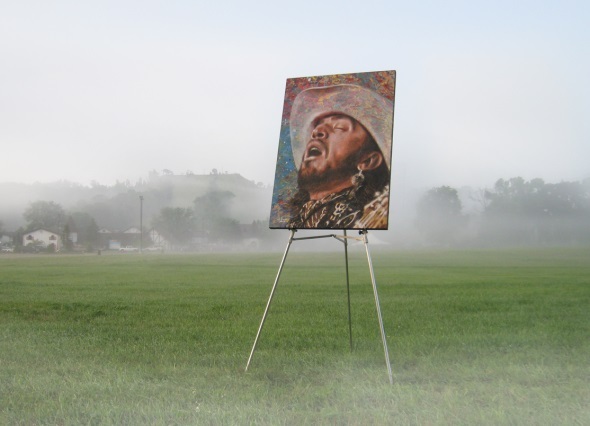 Tom aptly named the painting “Stevie – Above and Beyond” and emailed me this photo this morning that he took of the actual oil painting proudly standing just outside of Alpine Valley Music Venue. Tom Noll has completed another beautiful work of art with his captivating caricature of George Harrison that he aptly named: “Within You“. Click on the image below to be directed to Tom’s site for ordering information or eMail Tom now at Tom@TomNoll.comto order right away. 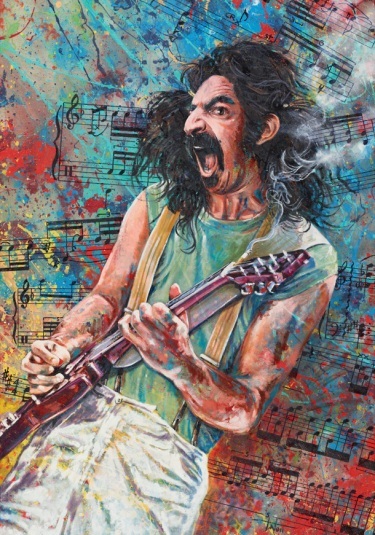 Tom Noll’s “Un-Named” Frank Zappa Painting Gets a Name! Well, what fun to put the title of my work into the hands of others. Thanks to everybody that joined in, and thanks to those who took advantage of the special intro pricing. There were some great appropriate names submitted, and the one I choose, comes from Bob Clark of Milwaukee, WI, USA. The simplicity of his name “Mutha” struck a chord with me. Thanks Bob! You know how to reach me if you want to take advantage of my 1/2 price offer & put “Mutha on your wall. 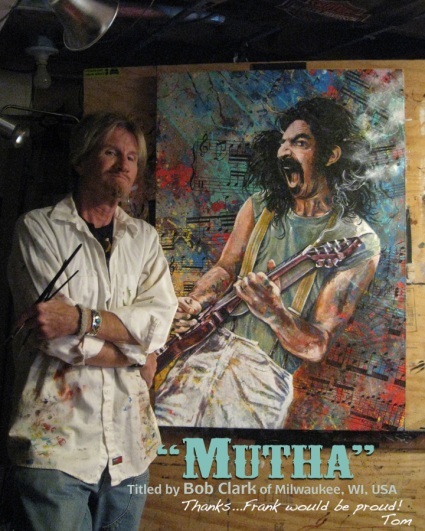 You can order a print of Frank Zappa, “Mutha” by [Following This Link]. Returning for a FZ name! With the busy holidays behind us, I want to revisit the painting I did recently that was never titled. 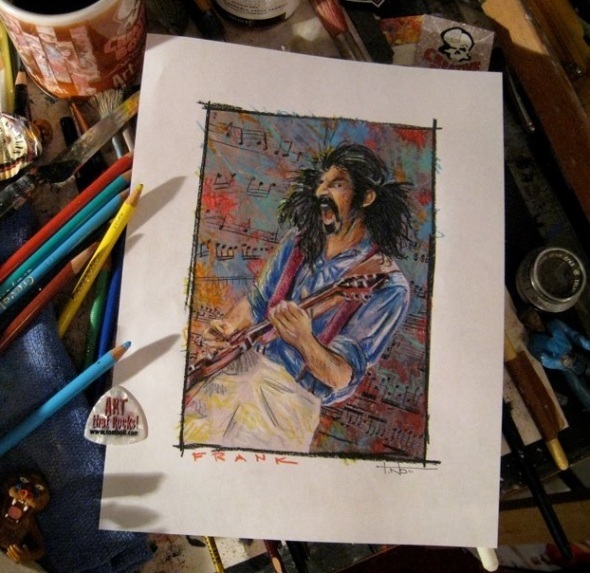 One of my most highly requested paintings…the one and only…Frank Zappa!!!! At the time of creation, I had alluded to a contest to name the painting, and a number of you have since asked if it was coming about. I’d now like to give people a chance to give it that perfect name. At the same time, I want to revert back to my original introductory price offer for print reproductions. As true Zappa fans step up to give this a proper title, I will offer a limited edition print at half the price of the intro offer to the person who comes up with the name that best fits my creation. I’d like more than just a song title, but will entertain names that aptly portray the Frank Zappa that held our attention for 3 decades of diverse musical influences, and continues…to this day. Prints during this contest will be intro priced at $239, plus $5 to ship ($12.50 international) If you’ve purchased one of the prints, and win with the best name, I’ll credit you half your funds back. If you’d like to lock in the lowest print number, Email me, I’ll invoice you via paypal, and you’ll have yours in your hands shortly. The contest, and intro price will end January 18th, and the winner will be announce the next day. Good luck, keep an open mind, & have fun! Here’s your chance to name the Frank Zappa painting and get 50% off a limited edition print! SO HOW DO YOU SUGGEST A NAME? ALL YOU HAVE TO DO TO ENTER THIS CONTEST IS LEAVE A COMMENT TO THIS POST WITH YOUR NAME SUGGESTION FOR THE FRANK ZAPPA PAINTING! TOM WILL SELECT THE OFFICIAL NAME OF THE PAINTING FROM THE COMMENT ENTRIES AND THE WINNER WILL RECEIVE 50% OFF THE PRICE OF A LIMITED EDITION PRINT! Tom’s Promise:If you are the winner of the contest and you also pre-ordered a print, your will receive a 50% refund! So go ahead and CONTACT TOM at Tom@TomNoll.com to pre-order now! CLICK HERE TO LEAVE YOUR NAME SUGGESTION! 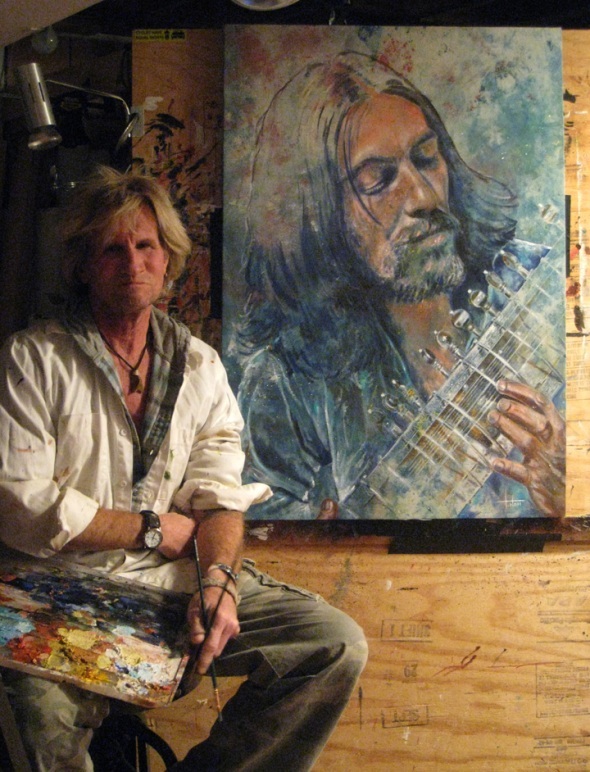 Tom Noll is Painting Frank Zappa! 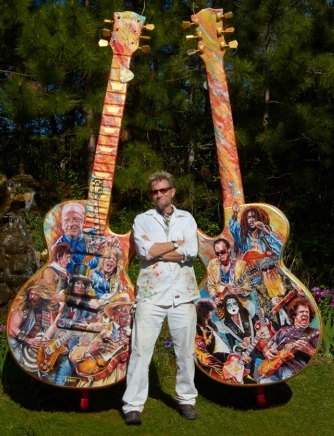 World-renowned artist Tom Noll is back at it again – with FRANK ZAPPA on his canvas! In a career spanning more than 30 years, Zappa wrote rock, jazz, orchestral works. He also directed feature-length films and music videos, and designed album covers. Zappa produced almost all of the more than 60 albums he released with the band The Mothers of Invention and as a solo artist. Take a look at the “Creative Bone ArtWorks” Official Web Site and browse Tom’s extensive gallery of “Art That Rocks” which includes many guitar players like Eric Clapton, Carlos Santana, Jeff Beck, Muddy Waters, Keith Richards, David Gilmour, B.B. King, Bruce Springsteen, Dave Matthews, Jimi Hendrix, Stevie Ray Vaughan, Les Paul, Johnny Cash, Gary Moore, Buddy Guy, Joe Bonamassa, Roy Buchanan, Ronnie Earl and Billy Gibbons. There you will find information about pricing, sizes and other info on Tom’s creative artwork. Tom estimates the yet-to-be-named Frank Zappa painting will take several weeks to complete (progress shots will be posted on his web site – CLICK HERE) be sure to bookark the page to follow along with the fun. Regular readers of TheGutiarBuzz have heard of Tom Noll, the artist behind the “Name the Painting” contests that we host. What you may not know, is that Tom also played a huge roll in the Gibson GuitarTown project in Waukesha, Wisconsin, the birthplace of Les Paul. Gibson Guitar chose the birth and resting place of guitar legend Les Paul for one of its acclaimed GuitarTown community arts project. Waukesha GuitarTown features 10-foot tall fiberglass Gibson Les Paul model guitars, and a series of regular size Gibson guitars, artistically designed by acclaimed Wisconsin artists and displayed in front of the city’s landmarks and businesses. Each guitar celebrates a musician, personality or artist unique to the region’s history, with guitar sculptures sponsored by local businesses and individuals. The Waukesha GuitarTown Project unites the Waukesha area music, art and business communities with a mission to raise funds to better the lives of those served by local charitable organizations, including Waukesha school music and art programs, the new Waukesha County Museum Les Paul exhibit, and the new Waukesha Community Health Center. 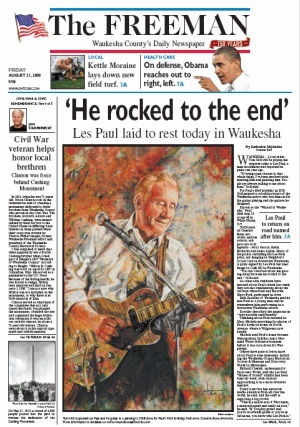 The launch event occurred this past June 1st, in honor of Les Paul’s birthday. Other Gibson GuitarTown cities include Los Angeles, Cleveland, Miami, Orlando, Austin, Nashville and London. The local news station (Fox 6) took an in depth look at the making of and meaning behind Guitartown in Waukesha this summer. Watch this exclusive video of two of the artists actually from the hometown of Les Paul toiled away with the project of a lifetime. [CLICK HERE] to see several progress shots of Tom as he painted the 10-foot guitar and to find out how you can order a print of the photo above! Recently, I had the opportunity to interview the man behind the brush, world-renowned artist and owner of Creative Bone Artworks, Tom Noll. 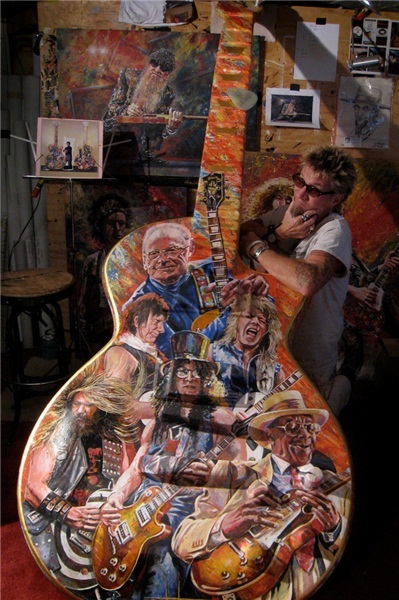 We had a great time talking guitars, painting, Harley’s, Les Paul and life. What is life like for you on an average day? Well, waking up is a good start. I never take a day for granted and I fill it with creativity. I’m always envisioning what I can transfer from brain to canvas, and how I can best capture my subject. A long ride on the Harley is always a good brainwave session. How long have you been painting “professionally”? My oil painting has only been the last 4 1/2 years. I’ve worked in the design and advertising world for 32 yrs., and after a serious health scare decided to start my Creative Bone Artworks and create a vibrant body of work to leave behind. 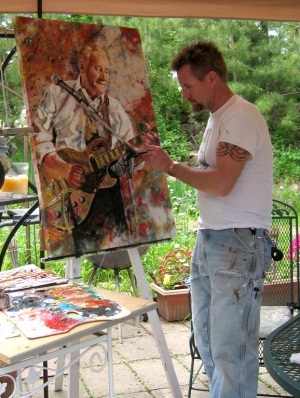 What made you choose Rock-n-Rollers and Guitar Players as your painting subjects? I mean…have you ever painted a picture of a barn in a wheat field? Starting out with fluid watercolors in the late 70’s, I painted the barns and landscapes and did the art fair circuit on the weekends. Recently, I painted the large 8’ x 9’ Bob Marley on request from a client and fell in love with the energy. Now, I live for the positive response to my work, and the happiness that I see it brings to others. Is it your goal to one day meet the person that you painted? You know, the “artist” meets the “artist” kind of thing? Have you been able to meet anyone that you painted? Yeah, its always great to meet that person after you’ve spent weeks looking into their psyche to discover what moves them, to bring them to life on the canvas. One such situation was my fortunate meeting with Les Paul, and hanging with him for an afternoon. Were you able to show him your work? What did he think? Oh yeah. He was very humbled and he signed several prints and the original oil painting. Its one thing to nail his image, but then you have to get his ax right. With Les Paul…talk about pressure! We used the painting as the backdrop to his book signing that day, and I gave him the framed print #1. He was thrilled! Ultimately, the image filled the front of the local newspaper on the day he was laid to rest. You know when you can put a guys image on his fan’s living room wall for that constant recognition, who wouldn’t be pleased with all that that brings. I keep missing Joe (Bonamassa) at his shows, and twice friends have delivered images to him for me. Once in Milwaukee, before I had painted him, he was shown what I was planning to do with him in that cool gold lame suit, and then after it was done, he saw an image of it finished in LA and he approved and signed a photo print to me. I’d had a “Name the Painting” contest with his fans going at the time, and I was told Joe wanted to submit an entry, but, well…he’s a busy guy. Tell me about your guitars! When did you start playing? I started on a Fender Squire, but I was really challenged and it didn’t even feel right. Then one day I said to myself, “well ya dumb &#%&, you’re lefty handed. So I flipped it over and restrung it, ala Jimi style…and immediately I sounded exactly like him…ha, ha! Do you have a favorite axe? Well, the Squire is now retired on the wall, graced with a Joe Satriani signature, and I’ve purchased 4 lefty guitars. I’ve got an electric acoustic guitar, a Martin Backpacker for on the Harley, a Custom Tele, but the Les Paul is probably my fav. Tom, you have painted an amazing list of past and present musicians. How do you go about choosing who will be on the easel next? You know, I’m pretty approachable, and often its by request…and if the subject is someone I’m passionate about, I’m off and running. I’ve also done my fair share of custom paintings for clients that the public never sees. Most guitar players will play guitar well into the late stages of their lives. What about painters? How long do you see this creative drive staying alive in you? Hmmm…I’m guessing the lifestyle of a musician is a bit more “late night” than mine. If they can hang in there, I’ll be right behind them with my brush. Then, as with the late Gary Moore, now that he’s passed, its my obligation to capture his spirit forever. 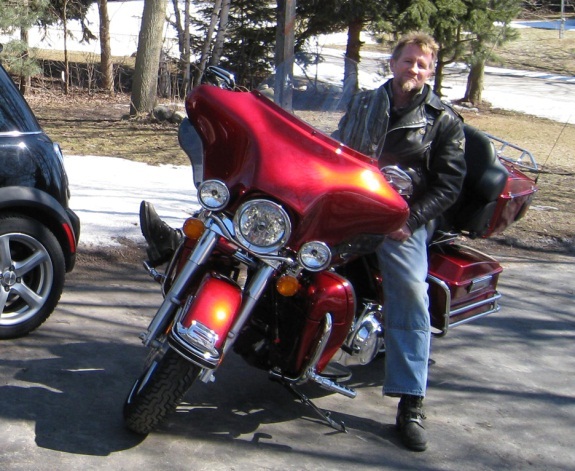 Other than painting and playing guitar, does Tom Noll have any other passions? Ha, ha…step into my garage! Tom Noll and his "Red Ripper"
What Has Tom Noll Been Up To? Regular visitors of TheGuitarBuzz know who Tom Noll is. 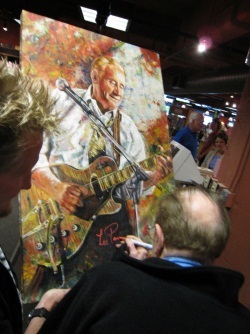 We have hosted several of Tom’s “Name the Painting” contests and watched Tom capture so many of our guitar heroes on canvas. So what has Tom been up to lately? Ok, I know I’ve been quiet…but I’m not goofing off…really!! On my site you’ll find pictures from day 1 to present, and links to articles about the GuitarTown project. There’s been some great media coverage and the tempo in town is building. Also, last week as the intro offer for the Billy Gibbons artprint came to a close, I drew a name from all the people who’d purchased prints, and I’ve shipped the classic black and white photo of Muddy Waters & Billy Gibbons out to the winner…Kevin Coe of “Old Friends Vintage Guitar Store” in Wentzville, MO. Congrats Kevin!! visit there…it keeps growing globally…thanks!!! Tom Noll is at it again… This time with guitarist Roy Buchanan! It’s time for another “Name the Painting Contest”! 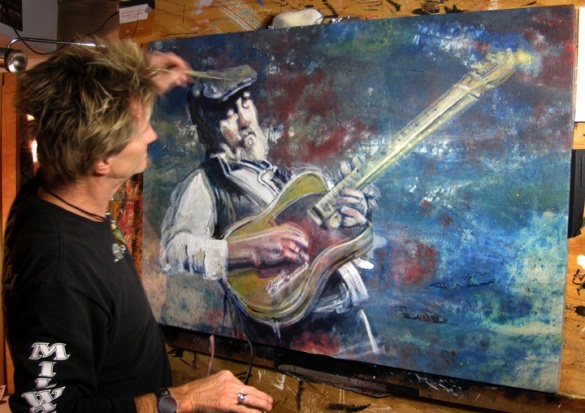 Artist Tom Noll has been busy pouring his talent into a stunning masterpiece of the legendary Roy Buchanan! Roy was a pioneer of the Telecaster sound. He was a brilliant sideman and solo artist, with two gold albums early in his career and two later solo albums that made it on to the Billboard chart. Despite never having achieved stardom, he is still considered a highly influential guitar player. He was often called “The Greatest Unknown Guitar Player” or “The Greatest Guitar Player that Nobody has heard of”. I think you will agree that Tom has captured Roy’s “vision”, he just needs a “name”! Roy Buchanan is Taking Shape! ALL YOU HAVE TO DO TO ENTER THIS CONTEST IS LEAVE A COMMENT TO THIS POST WITH YOUR SUGGESTION FOR A NAME OF THE ROY BUCHANAN PAINTING! TOM WILL SELECT THE OFFICIAL NAME OF THE PAINTING FROM THE COMMENT ENTRIES AND THE WINNER WILL RECEIVE A FREE PRINT OF THE ORIGINAL OIL PAINTING! GUITARDADDY TIP: As you can see, this painting is already in the works and according to Tom, is about one week from completion. So this contest will be short! The winner will be announced on FEBRUARY 1, 2012 and will receive a FREE PRINT from the original oil painting! Tom is also offering a discount for pre-orders with an introductory price of $222 plus shipping for “pre-order low-number reservations” and only $199 for orders that are “pre-paid”. Tom’s Promise: If you are the winner of the contest and you also pre-ordered a print, your money will be refunded! So go ahead and CONTACT TOM at Tom@TomNoll.com to pre-order now! CLICK HERE TO LEAVE YOUR COMMENT AND ENTER THE CONTEST! Note: In the case of duplicate submissions, the person who suggested the name first will have claim to that name. Also note, the winner will forfeit any and all rights to the name to Tom Noll if it is selected to be the winner. GOLDFINGERz, Tom Noll Painting of Joe Bonamassa AVAILABLE! 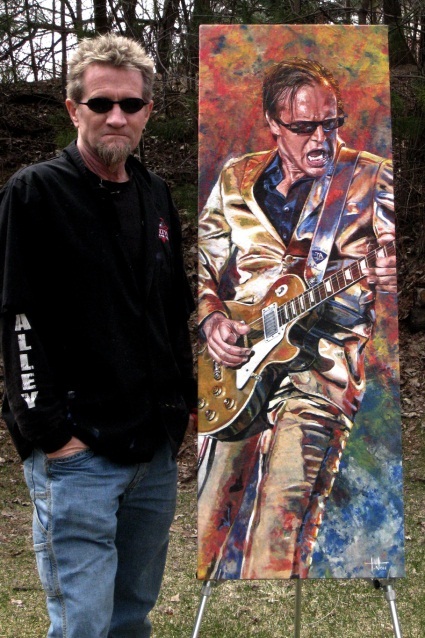 Tom Noll with his painting of Joe Bonamassa, "GOLDFINGERz"
Check out the Latest GUITAR ART BUZZ! The long awaited print of the Joe Bonamassa oil painting, “GOLDFINGERz”, is now available! After a patient wait by Joe’s avid fans, the print is finally here! Available is a 13″ x 37 1/2″ giclee paper print of the Tom Noll original work in oil of Joe tearing into it at Montruex, in his Gold Lame suit. Tim Sorrell Jr. appropriately named that painting “GOLDFINGERz” to Tom’s liking. (Photo reference courtesy of Dr. Jazz…Ueli Frey of Switzerland). This piece is available to grace your walls for an intense visual while you’re drifting to Joe’s bluesy tones that you know and love. Visit Tom’s site, Creative Bone Artworks, to place an order directly with him. With same day shipping, Joe will be on a plane headed your direction! I was lucky to catch a glimpse of this pose from the 2010 Montruex Jazz Fest (Photo reference courtesy of Dr. Jazz… Ueli Frey of Switzerland), and immediatly envisioned this killer painting. I’m proud to be able to spread the word of Joe, and offer to the fans around the world, a visual to go with their prized music collections. 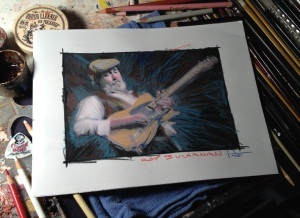 Tom has been very gracious in allowing TheGuitarBuzz.com to announce the availability of this print to the world! I want to publicly thank Tom for his support of THE BUZZ and for his faith in this website’s ability to spread the word about GOLDFINGERz. I received my GOLDFINGERz print a couple of days ago and will say that it’s an absolute stunning work of art! I highly recommend that every fan of Joe Bonamassa order this print. Believe me, you will not be disappointed! 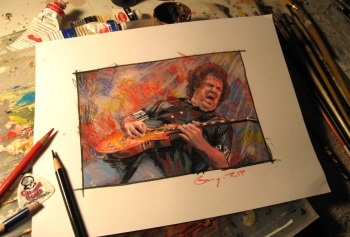 Tom Noll Soon to Release Painting of the Late Gary Moore PLUS Live at Montreaux CD and DVD Give Away Contest! Many of you know world-renowned artist Tom Noll from my previous posts. It was 1 year ago today, 11/21/10 that I discovered Tom and wrote about his work here on TheGuitarBuzz.com. Since that post, Tom and I have become good friends and I have a couple of his prints hanging in my office (Carlos Santana and Jeff Beck). I check on Tom’s web site every so often and when I looked on Sunday I was amazed to learn that he has “the late Gary Moore” on his canvas and “in the works” right now. I always have been and always will be a fan of Gary Moore and will eternally regret that I never saw him play in person. In honor of the “soon to be released” print, I am announcing a Gary Moore CD/DVD Giveaway contest right here on TheGuitarBuzz. To enter, all you have to do is leave a comment to this post about Gary Moore. I have 2 CDs and 1 DVD of “Gary Moore Live in Montreaux 2010” that I will give away FREE to 3 winners via random drawing from the comments left to this post. The contest will end at 12:00noon MST on the day after Tom Noll notifies me that the Gary Moore print is ready to ship. After decades of monster guitar work on his own albums and with Thin Lizzy, Cozy Powell, Rod Argent, Ginger Baker, Jack Bruce and others, Moore dug deep into blues before returning to rock in 2010. After years of blues explorations, this performance marked a return to hard-charging rock for Moore. In fact, the former Thin Lizzy guitarist was working on a new rock album at the time of his death. Providing a hint of what might’ve been, Moore performed three brand new songs that night at Montreux – all of which are included here. “Days of Heroes” is a strident, stomping rocker with Moore belting a furious vocal. “Where Are You Now” leans into a slow, insistent beat. 05. Where Are You Now? 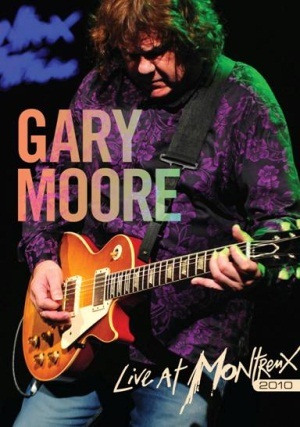 CLICK HERE TO LEAVE A COMMENT TO THIS POST AND BE ENTERED IN THE GARY MOORE CD-DVD GIVEAWAY. THERE WILL BE THREE WINNERS! The Winners have been notified by eMail! Thank you for entering the contest! !